Download "Chapter 19. 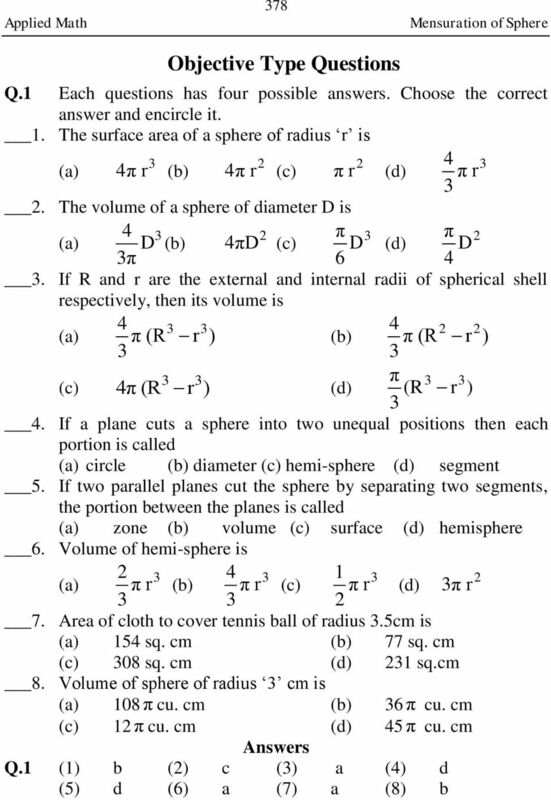 Mensuration of Sphere"
8 75 r = cm h = 1cm d = 0cm π Volume of the sphere = d π = (0) = cu. cm Volume of the zone = π h (h + r 1 r ) = π x 1 (1 + ) = π x ( ) = 1.95 cu. cm. 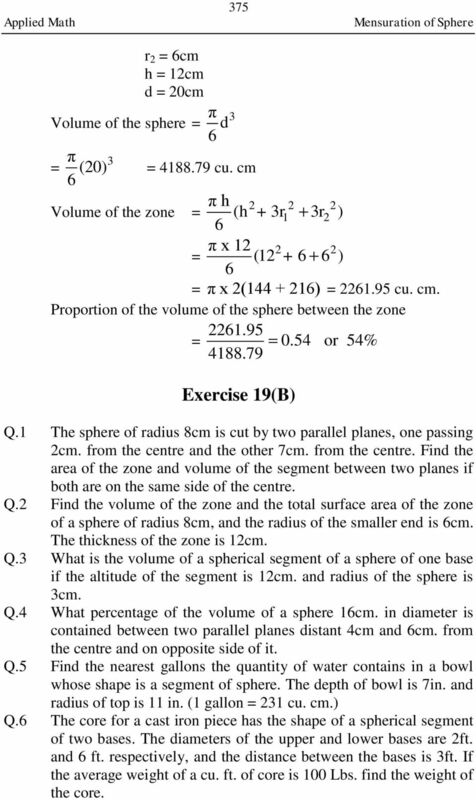 Proportion of the volume of the sphere between the zone = or 54% Exercise 19(B) Q.1 The sphere of radius 8cm is cut by two parallel planes, one passing cm. from the centre and the other 7cm. from the centre. 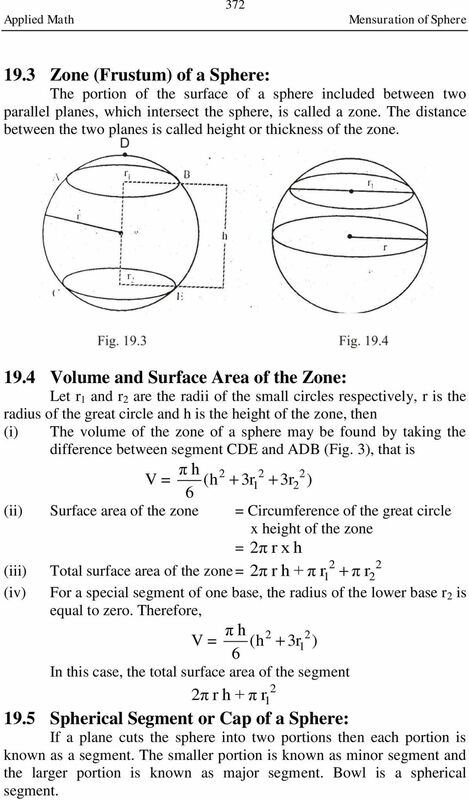 Find the area of the zone and volume of the segment between two planes if both are on the same side of the centre. Q. 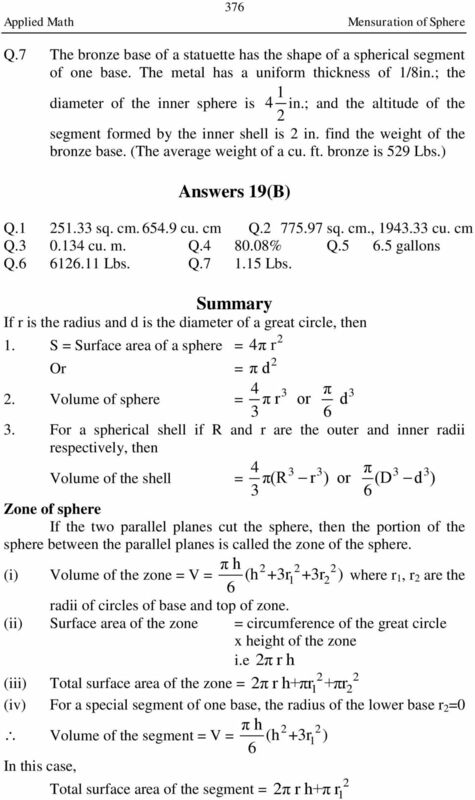 Find the volume of the zone and the total surface area of the zone of a sphere of radius 8cm, and the radius of the smaller end is cm. The thickness of the zone is 1cm. Q. 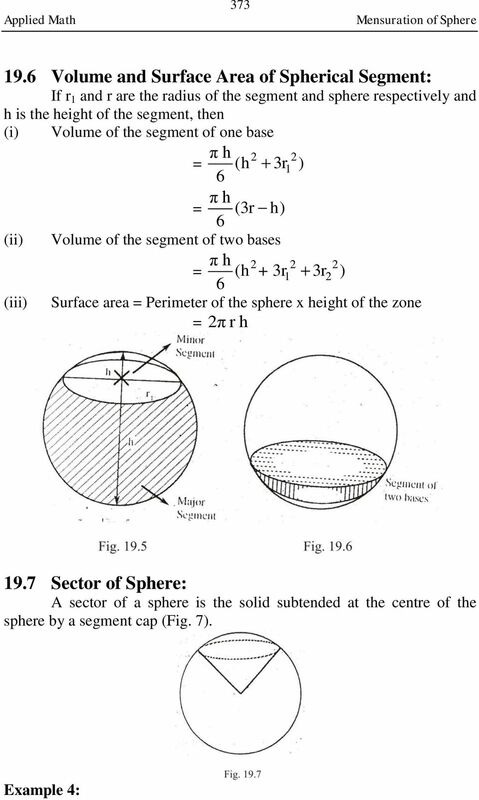 What is the volume of a spherical segment of a sphere of one base if the altitude of the segment is 1cm. 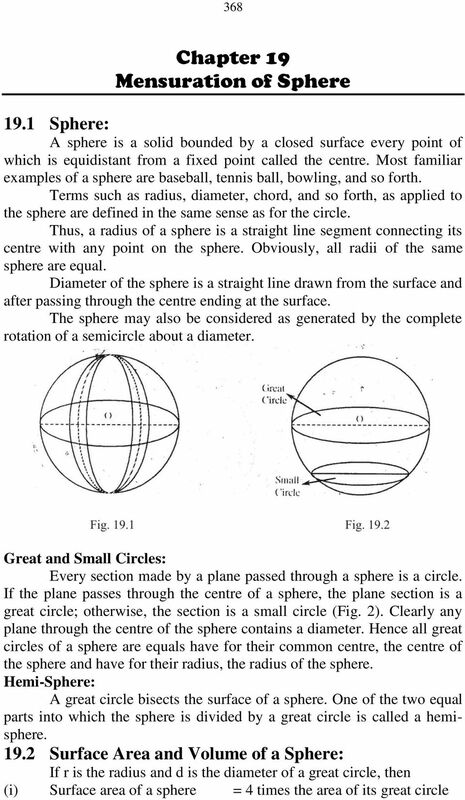 and radius of the sphere is cm. 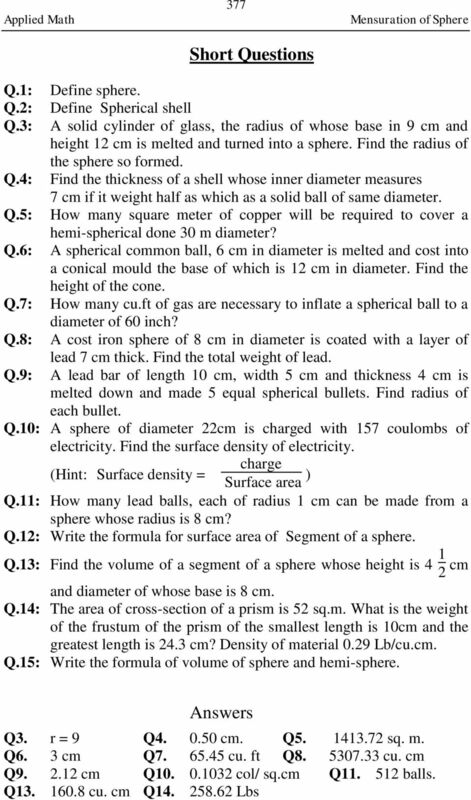 Q.4 What percentage of the volume of a sphere 1cm. in diameter is contained between two parallel planes distant 4cm and cm. from the centre and on opposite side of it. 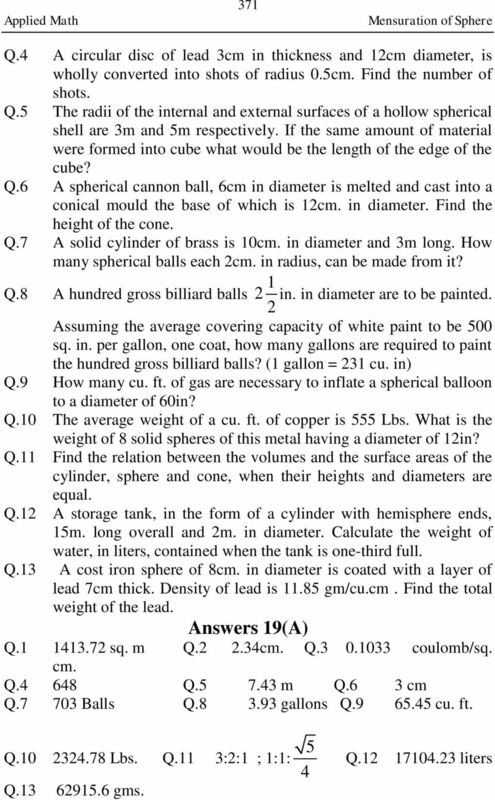 Q.5 Find the nearest gallons the quantity of water contains in a bowl whose shape is a segment of sphere. The depth of bowl is 7in. and radius of top is 11 in. (1 gallon = 1 cu. cm.) Q. The core for a cast iron piece has the shape of a spherical segment of two bases. The diameters of the upper and lower bases are ft. and ft. respectively, and the distance between the bases is ft. If the average weight of a cu. ft. of core is 100 Lbs. find the weight of the core. 12 79 Linear and Area Measure: Linear Measure: 1 inches (in) = 1 foot (ft.) feet = 1 yard (yd) inches = 1 yard 0 yards = 1 Furlong (Fr.) 8 Furlong = 1 Mile (mi) 170 yards = 1 mile 1 meter (m) = 1000 centimeter (cm.) 10 millimeters (mm) = 1 cm. 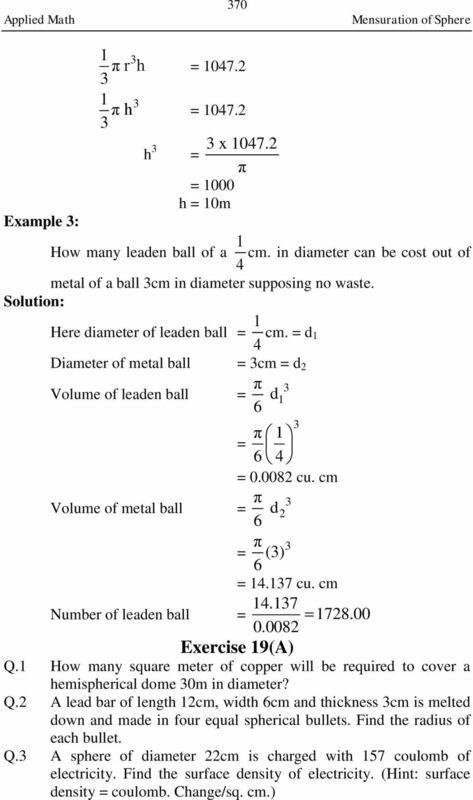 10 cms = 1 decimeter (dm.) 10 dm = 1 m 10 m = 1 Dekameter (DM.) 10 Dms. = 1 Hectometer (HM.) 1 inch =.54cm 1 ft. = 0.048m 1 yd = m 1 mile = 1.09 Km 1cm = 0.97 in. 1 m =.808 ft. 1 m = 1.09 yd 1 Km = 0.14 mile Area Measure: 1 sq. ft. = 144 sq. in. 1 sq. yd. = 9 sq. ft. 1 sq. yd. 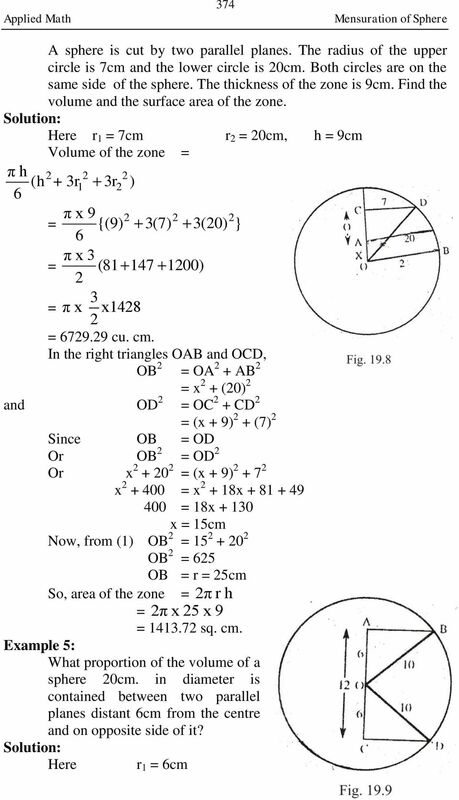 = 19 sq. in 1 sq. 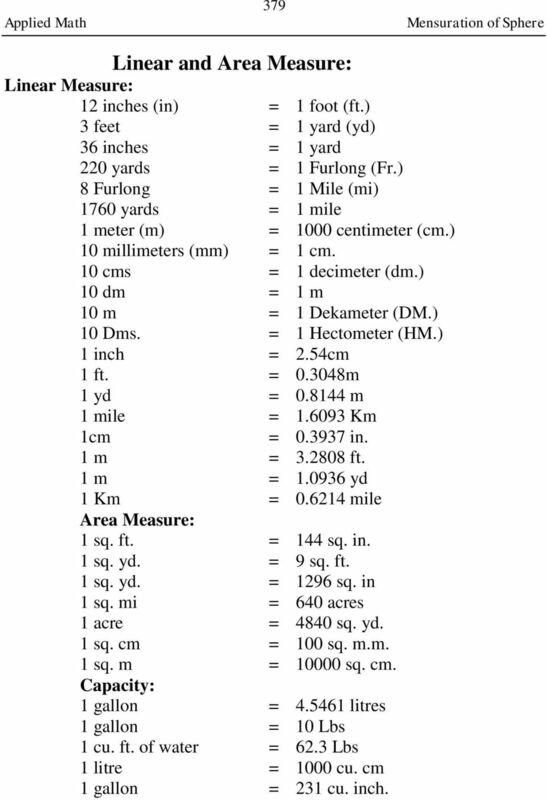 mi = 40 acres 1 acre = 4840 sq. yd. 1 sq. cm = 100 sq. m.m. 1 sq. m = sq. cm. Capacity: 1 gallon = litres 1 gallon = 10 Lbs 1 cu. ft. of water =. Lbs 1 litre = 1000 cu. cm 1 gallon = 1 cu. inch. 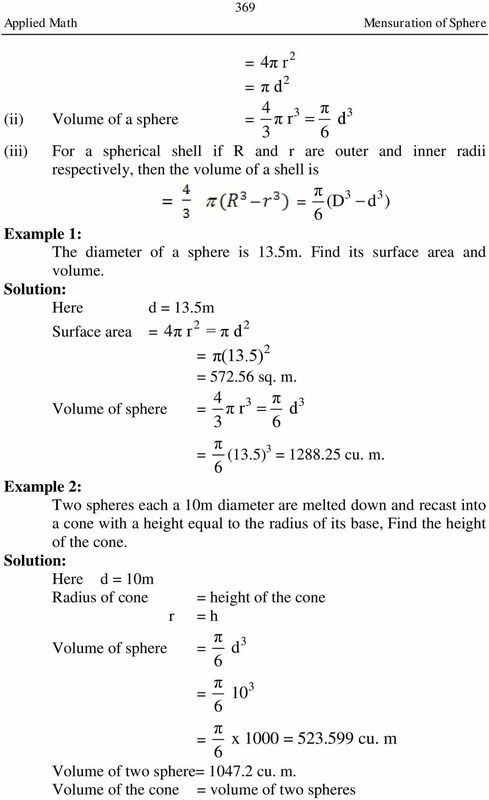 Volume of Pyramids and Cones. Tape together as shown. Tape together as shown.